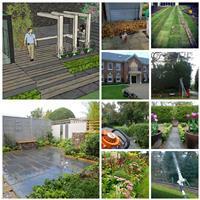 All Year-Round professional garden Maintenance service. We are a friendly and reliable garden maintenance service based in Sutton, Surrey. With over 15 years’ worth of experience in gardening Richard, the founder of RHGM, is a skilled and knowledgeable gardener and award winning designer with a keen interest in all aspects of gardening and horticulture. RHGM offer weekly & fortnightly maintenance programs to keep your garden looking fresh and healthy, we also accept and can quote for one off jobs. LAWN CARE - mowing / feeding / seeding / weed control / edging / aerating / scarifying. HEDGE WORK - trimming / shaping / reduction / clearance / planting new hedges. AUTUMN GARDEN CARE - Leaf clearance / lawn treatment / protecting fragile shrubs / transplanting / shrub & hedge planting / bulb planting / cutting back of herbaceous perennials / final hedge cutting. PLANTING - redesigning planting boarders / filling gaps in boarders & hedging / tree & hedge planting / pots - hanging baskets & troughs. JET-WASHING - patios / walls / decking / block paving with re-sanding. FULL GARDEN CLEARANCE - tackling overgrown gardens / dismantlement of sheds - greenhouses / stripping the garden bare. TURFING - preparation of the ground ready for turfing / supplying & laying new lawn. FENCING - wooden & concrete post fencing / overlap & feather edge panels. Please see our photo album and website for examples of our work. Surrey, South London, Epsom, Ewell, Cheam, Belmont, Sutton, Banstead, Kingswood, Worcester Park, Raynes Park, Wimbledon.